Supplier Relationship Management or SRM is still relatively new for many companies and in many cases badly misunderstood. A simple definition is “SRM is the process of fully leveraging your supply base to ensure that you are taking advantage of the assets, knowledge, technology and deep expertise of your key suppliers.” So often, your suppliers are in a position to see your company from many different perspectives, across multiple divisions and in many cases, how you operate across many different geographies. If you have done a good job in selecting the very best suppliers, then why wouldn’t you want to engage them to the fullest extent and get their input and ideas? When I addressed suppliers participating in SRM programs I have run, I would often say to them that they know more about the particular area in which they serve our business than we do. That comes from what they do so well for our company and for many other similar customers. And I always wanted to hear what they were doing with their best customers that they were not doing with us. The following chart from Vantage Partners, a thought leader in SRM, does a good job in defining what SRM is and is not. Along so many different parameters, the SRM view of the relationship with suppliers is based on mutual respect, trust and open and honest communications. This is a major step forward from the old school approach to dealing with our suppliers that was based on limited and infrequent communications, mistrust , coercion and zero sum negotiations. I will always remember sitting in on another company’s SRM forum with so many of their suppliers and the first words out of the CPO’s mouth were that the suppliers needed to reduce their prices by 5% across the board. You can imagine how that was received by the participants and what that did to their engagement. Process efficiencies for the customer and supplier. This could relate to how the companies plan and interact as well as the more technical aspects of how each company operates in producing the specific goods or services. The supplier often has many similar customers and can draw on a deep body of best practices that they have seen in the marketplace. New Product or Revenue Ideas. This takes Procurement to a very different place in the eyes of their company when they are participating, as they should, in driving the revenues of the company. Specifications and product design. Suppliers can provide important input to specifications and product improvements and provide important resources and ideas for continuous improvement. Demand management or what I like to call consumption and specification management. This involves right sizing the specifications and making sure that demand is monitored appropriately within the company. A simple example of this was the work we did in travel, making sure that our employees traveled with the appropriate airlines and on the appropriate class of service, with reservations made 15 days or more in advance of the travel to ensure that the very best rates were obtained. Joint planning. So many of the inefficiencies we see in our operations and in those of our suppliers have to do with lack of coordinated planning. This is a simple activity that will ensure that each party clearly understands their commitments and timelines for delivery, to avoid unnecessary delays, inventory builds or added costs to expedite. Market Intelligence. Your suppliers are a valuable source of information on the marketplace in general (sales, growth, new products, pricing, etc.) as well as for specifics on competitors. Key components of all of these processes are a formal governance process that lays out exactly what and when you will do certain activities, a commitment to frequent and candid communications and two way feedback. So why aren’t more companies embracing SRM? I think that many companies still see significant and measurable value through traditional sourcing and have not yet seen the pressure of diminishing returns. So many of our sourcing professionals have been measured and rewarded from the traditional activities and have a hard time devoting the time and effort to something that they are not sure will deliver value. So part of this is making sure that SRM is part of a team’s goals and objectives and making sure that you do this with a select group of suppliers who are as interested in doing this as you are. Focus on those suppliers who can have a significant impact on your business and only work on those ideas that can generate great value for both parties. And lastly, dedicate the appropriate resources to these activities across the company, and closely track your progress. 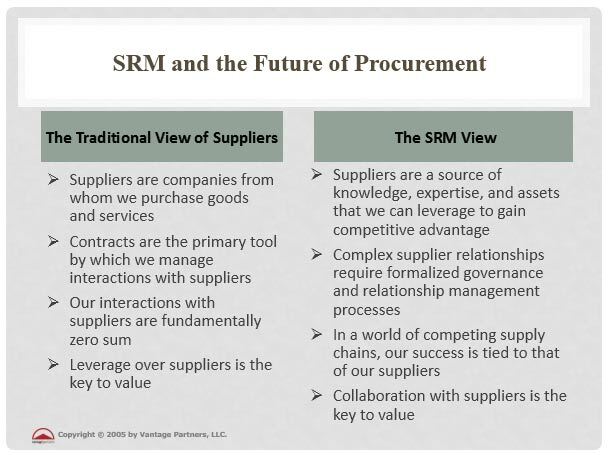 Here is to SRM and to expanding the ways in which Procurement can add value to the enterprise. Ethics in Procurement. It’s Absolutely Essential!